Briefly: In our opinion, a speculative short position (full) in gold, silver and mining stocks is justified from the risk/reward point of view. 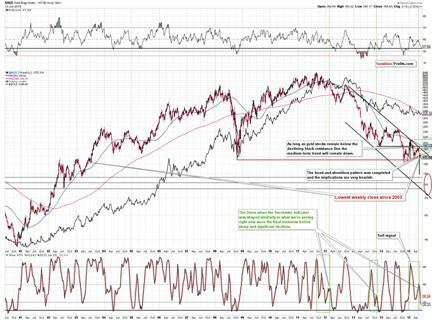 We have previously commented on the mining stocks’ underperformance relative to gold and its bearish implications. Last week, however, we saw something even more profound. The HUI Index broke below the 2014 low in terms of the weekly closing prices and it was the lowest weekly close since 2003. 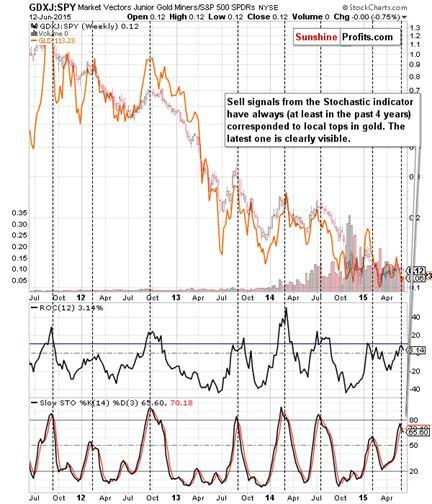 Does this major sign signal the beginning of the final major slide in the precious metals sector? The HUI Index didn’t close much below the 2014 low, but still, it happened. The breakdown is not yet verified – it’s not significant (the HUI didn’t close the week much below the lowest weekly close of 2014) and it was not confirmed in terms of time. Moreover, we have yet to see a breakdown in terms of daily closing prices and intra-day lows. Consequently, the weekly breakdown doesn’t have very (!) bearish implications just yet, but it does indicate that the odds for a continuation of the decline have further increased. What’s more significantly bearish, is the completion of the head and shoulders pattern and the analogy seen in the Stochastic indicator. The head and shoulder pattern that took about 6 months to complete is something that could trigger another major slide in the precious metals sector. The target based on this formation is at about the 120 level for the HUI Index, which is the upper border of our target area. The targets based on the H&S pattern tend to work on an “at least” basis, so it seems that our target area is even more likely to be reached. The important thing is that the HUI moved below the neck level of the pattern, and based on the short-term H&S, it’s likely that the move below the neck level of the bigger H&S will be clearly visible and thus much more meaningful. As far as the Stochastic indicator is concerned, please compare the current situation with the 2 previous periods when we saw similar performance – we marked these cases with green rectangles. In both cases big declines followed. Consequently, there is another factor pointing to lower mining stock prices (which is in tune with the medium-term trend). 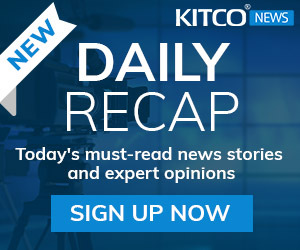 Not much happened in gold and silver on Friday, so we will not describe them once again in greater detail (however, comments from our previous Gold & Silver Trading Alerts remain up-to-date). There is one thing that we covered previously that we would like to bring up once again. The above chart features junior mining stocks’ performance relative to the performance of the general stock market. 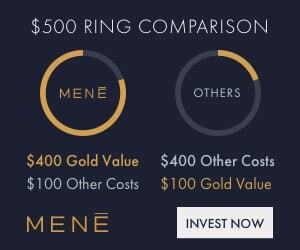 This ratio moves quite in tune with gold, as when we take out the link between juniors and other stocks, the main driver of their prices is the underlying metal (either gold or another metal that moves in tune with gold anyway). The bottom line is that since this ratio moves in line with gold (but slightly differently) it can be used as a confirmation of gold’s moves. The way that we can use the above knowledge is to apply the Stochastic indicator to the ratio. In each (!) case when the Stochastic indicator flashed a sell signal it was either at or close to a major top. If gold was moving higher before this signal it suggested that the top is about to be formed and if gold was moving lower before the signal, it confirmed that the top was indeed formed. We have just seen this little-known but very accurate signal and the implications are very bearish. The reason that we’re bringing this up once again is that the sell signal from the Stochastic indicator is now even more clearly visible and thus what we wrote above is even more meaningful than it was previously. 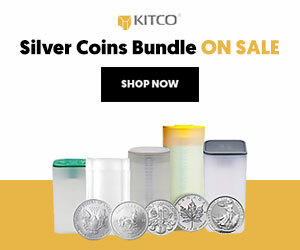 Summing up, more and more signs seem to confirm our outlook for the precious metals sector – it seems that the final bottom is still ahead of us. 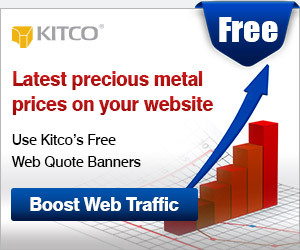 The current short positions in the precious metals sector are already profitable but it seems that they will become much more profitable in the future, so we are keeping them intact.